Charlotte Pipe and Foundry chose Affinity Energy to implement a monitoring and measuring system that controls peak energy usage and saves them thousands of dollars every month. For over a century, Charlotte Pipe and Foundry Company (CPF) has been manufacturing the industry's broadest range of standard and specialty drain-waste-vent products, including cast iron and plastic pipe and fittings. Charlotte Pipe is headquartered in Charlotte, NC, and has seven plant locations across the United States. Because of Affinity Energy’s solution, we save approximately $6,000 per month; $12,000 during the summer months. Without the monitoring and measuring systems Affinity help put in place, we would not have the means to even begin making energy saving decisions. Managing energy costs for large industrial facilities can be challenging. Like many manufacturers, Charlotte Pipe and Foundry (CPF) viewed high energy costs as a necessary evil. After all, raw iron must be melted by massive furnaces and poured into casts to make plumbing pipes. And that requires massive furnaces drawing lots of electricity. Unfortunately, the method by which their electric bill was calculated penalized them for the way they operated. Electric utility companies typically charge industrial customers based upon two measurements. The first is consumption, which is total kilowatt hours used. The second measurement is demand, which is based upon peak energy usage during a pre-set timeframe. Being billed on a time of use rate meant Charlotte Pipe and Foundry was charged for its highest 30-minute energy demand average for the month. This peak usage varied considerably and added tremendous cost to the facility’s electric bill. In the case of Charlotte Pipe and Foundry, electric furnaces continuously ran at high temperatures with no monitoring or variable control, so peak energy usage and electricity costs were extremely volatile. The real challenge was smoothing out the peak demand between 6:00 AM and 1:00 PM during the hot summer months of May-September. 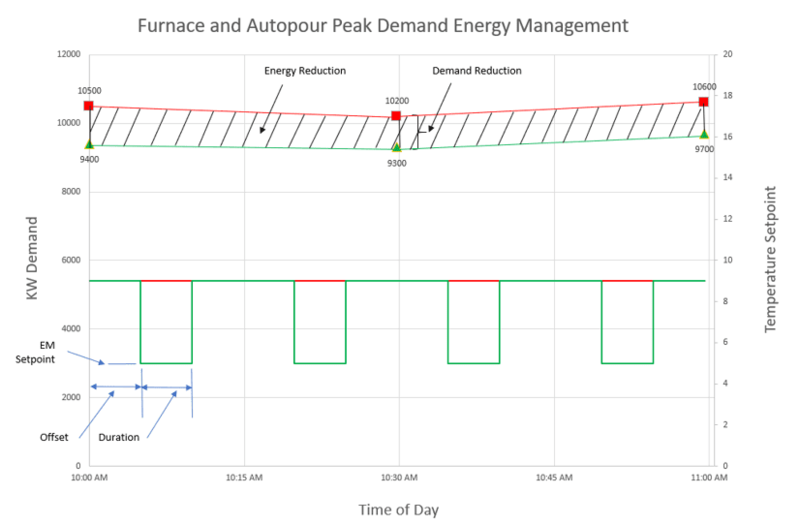 In order to better manage and reduce their energy bill, CPF needed to control peak usage during the 15-minute time blocks the power company used for measuring demand. 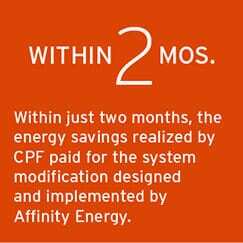 So CPF called Affinity Energy. They heard about Affinity Energy’s reputation for innovative solutions and their experience integrating components from multiple manufacturers. Charlotte Pipe and Foundry’s system included Schneider Electric, General Electric, and Rockwell/Allan Bradley components. Because Affinity is an open systems integrator, and certified by all three vendors, they were easily able to design and build a monitoring system integrating all three manufacturers. CPF’s engineers previously experimented with lowering furnace temperatures for brief time periods and determined the molten iron would not be affected. So Affinity Energy developed a modified control sequence that allowed the furnace operator to initiate an automated energy conservation mode that activated for five minutes during each 15-minute time block. Affinity Energy was also able to integrate metering for real-time monitoring of energy consumption. By dropping the temperature of the furnace once during every 15-minute time block, the energy conservation mode virtually eliminated excessive consumption spikes. Within just two months, the energy savings realized by Charlotte Pipe and Foundry paid for the system modification designed and implemented by Affinity Energy. The folks at Affinity Energy are first and foremost very knowledgeable about what they do. A close second is their ability to work with you to understand your process and come up with a solution you want, not try to fit you into their box.